Only in Paris – legalised art squat. 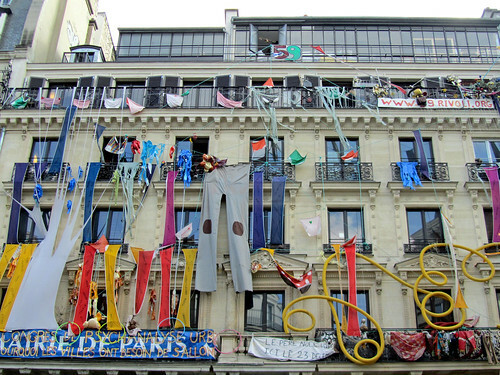 Just over a decade ago, artists began to squat at 59 rue de Rivoli, a dilapidated former building of Credit Lyonnais. What flourished next was a series of colourful installations at the façade of the street, attracting attentions aplenty and drawing admirers of free expressions of arts. It really is impossible to miss this building if you’re going down rue de Rivoli. When the building was declared dangerous in mid-2000s, it was thanks to the support of fans as well as the media that the building, instead of simply being shut down, underwent a restoration process that would take approximately three years (between 2006 and 2009) to complete. Its reopening saw legalisation of the premises as free home to resident artists and the birth of 59Rivoli.org, its doors open to visitors without admission charges. It’s a dynamic art house with works at various stages, from inception to finalised pieces.